Daled Amos: After Lausanne, Where Does the Agreement/Framework/Understanding With Iran Stand Now? Can the administration regain momentum in DC after Lausanne debacles? - Lausanne may turn out to be pyrrhic progress for the Obama administration. The White House had hoped to use this round to lock down an agreement by March 31, which would build momentum heading into further negotiations. Instead they not only missed the deadline, but they looked bad doing it. Seemingly every morning before March 31 had a scoop about a different enormous concession to Iran. On Wednesday the WSJ revealed that the US had punted on Iranian disclosure, on Thursday the AP revealed the US may let the Iranians spin centrifuges at their underground military bunker at Fordow, and on Monday The New York Times revealed that the Iranians had backtracked on shipping out their enriched uranium - and quoted a US official promising to find alternative solutions acceptable to Tehran. Then after the deadline slipped, there was coverage of FMs expressing wildly different public assessments, Zarif threatening the West that this is their last best chance, the Iranians digging in on new demands, administration press conferences being canceled, etc. The total effect was summed up by a senior Congressional staffer speaking to a reporter on the ground in Lausanne: "people here are wondering what the f___ is going on". How much of the deal will be secret? What did the US have to give the Iranians to make a public commitment? - The overarching dynamic from the last week has actually been very basic: the Americans wanted the Iranians to publicly commit to specific concessions and the Iranians kept refusing. But the P5+1 has made a range of highly publicized and functionally irreversible concessions to Iran across every core area involved in the talks because the Iranians refused to budge: centrifuge dismantlement, zero enrichment, heavy water plutonium-related work, ballistic missile development, disclosure, etc. Then there was the Lausanne flood of concessions. US negotiators couldn't go back to Congress now and say 'the Iranians won't give us anything yet, but they promise to make concessions some time in the future after they get more relief.' So for the last two days, US negotiators struggled to find anything more they could give the Iranians, in exchange for which the Iranians would make a public commitment on something. Question 1: did they succeed in getting the Iranians to make a public concession? Question 2: what did the Americans have to give up to get that public concession? What happened to P5+1 unity? - If the NYT has their scoop right, the joint statement will be from Iran and the EU, not Iran and the P5+1. The arrangement will raise eyebrows. The importance of maintaining P5+1 unity has been the argument - the central argument - that the administration has used to push back against efforts by Congress to impose new sanctions. The claim has been that Iran will walk away if Congress acts, then the P5+1 will blame Washington and fracture, then the sanctions regime will collapse. If there are already divisions inside the P5+1, that argument will get significantly less play - and the administration will be asked to explain why Congress shouldn't have acted earlier. Remember that Russian FM Lavrov and Chinese FM Wang left Lausanne as talks were coming down to the wire. 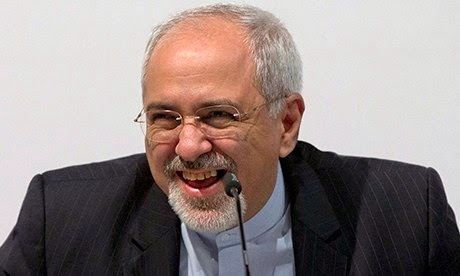 As per the AP report on Thursday, Zarif confirmed the U.S. has completely caved on the Fordow - the underground bunker, built into the side of a mountain, which the Iranians emptied and made into an illicit enrichment facility. President Obama said as late as 2012: "We know they don’t need to have an underground, fortified facility like Fordo in order to have a peaceful program", and the Iranians said 'no'. In response, the US conceded and said Iran could keep it open as a research facility, but they had to remove all the centrifuges for storage. This was claimed to a sign of Iranian flexibility. Then this week, it emerged that in fact the Iranians would be allowed to keep centrifuges spinning inside the mountain, spinning Germanium or similar non-nuclear elements as opposed to Uranium. The Obama Administration is claiming there will not be any "enrichment" going on at Fordow - a claim that ignores the fact centrifuges spin isotopes into lighter and heavier elements, thereby "enriching" the material. That's what they do. Allows N-generation centrifuge R&D beyond the reach of the West- since the process is the exact same process, Iran will have a hardened facility where it will be able to research and develop N-generation centrifuges. Zarif bragged from the stage in Lausanne that Iranian R&D on centrifuges will continue on IR-4s, IR-5s, IR-6s, and IR-8s, and that the pace of research will be tied to Iranian scientific progress. The development of advanced centrifuges would give the Iranians a leg up if they decide to break out, and will put them instantly within a screw's turn of a nuke when the deal expires. Leaves Iranian nuclear infrastructure running beyond the reach of the West - if the Iranians kick out inspectors and dare the world to respond, the West will have zero way to intervene. The Iranians will have a head start on enrichment, and a place to do it beyond the reach of Western weapons. The administration's early pushback has been that the breakout time will still be a year, so they could in theory reimpose sanctions, but it takes more than a year for sanctions to take an economic toll. So: zero options to stop a breakout. And now you know why Mohammed Zarif is laughing.